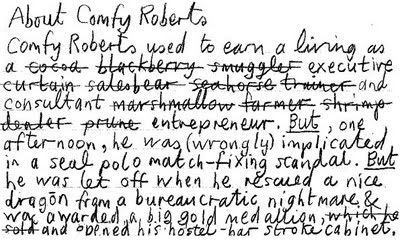 Comfy Roberts used to earn a living as a cocoa blackberry smuggler executive curtain salesbear seahorse trainer and consultant marshmallow farmer shrimp dealer prune entrepreneur. But, one afternoon he was (wrongly) implicated in a seal polo match-fixing scandal. But, he was let off when he rescued a nice dragon from a bureaucratic nightmare & was awarded a big gold medallion, which he sold and opened his hostel-bar stroke cabinet. 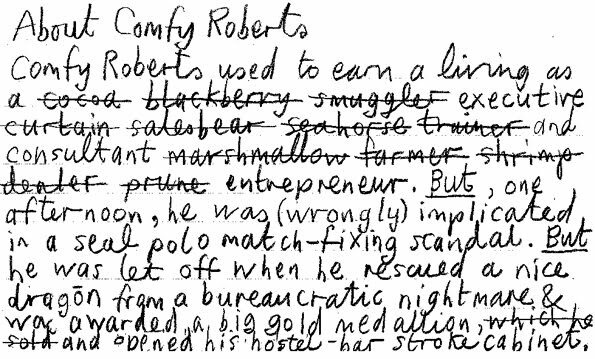 Ah, Comfy Roberts! His spotless snow-white fur on the outside, and his hidden, colourful, rainbow-soul inside. 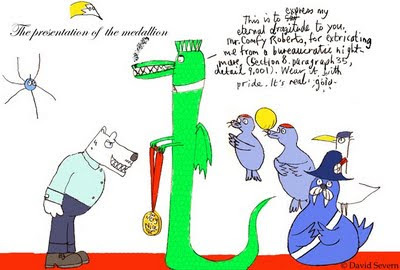 A dragon-rescuer. He is my hero.